ESEQuant LR3 Next-generation technology for point-of-need tests The ESEQuant LR3 is a highly sensitive, robust, and cost-effective fluorescence measurement system for rapid tests at the point of need. This flexible and reliable system, based on a ready-to-use concept, enables you to easily develop fluorescence or colorimetric tests. Starter kits are immediately available and can be rapidly adapted to various test strip or cassette formats. The powerful combination of fluorescence reader, state-of-the-art touchscreen, and comprehensive developer´s Lateral Flow Studio Software provides an easy-to-customize and easy-to-operate lateral flow system. 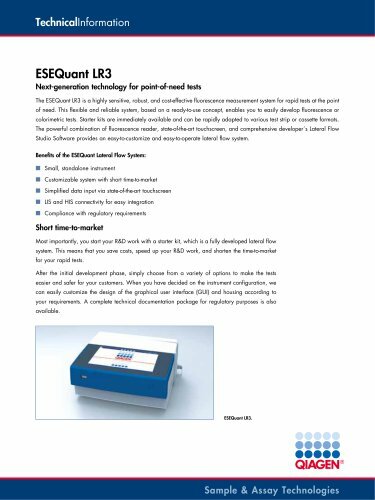 Benefits of the ESEQuant Lateral Flow System: ■■ Small, standalone instrument ■■ Customizable system with short time-to-market ■■ Simplified data input via state-of-the-art touchscreen ■■ LIS and HIS connectivity for easy integration ■■ Compliance with regulatory requirements Short time-to-market Most importantly, you start your R&D work with a starter kit, which is a fully developed lateral flow system. This means that you save costs, speed up your R&D work, and shorten the time-to-market for your rapid tests. After the initial development phase, simply choose from a variety of options to make the tests easier and safer for your customers. When you have decided on the instrument configuration, we can easily customize the design of the graphical user interface (GUI) and housing according to your requirements. A complete technical documentation package for regulatory purposes is also available.